LITTLE STEVEN'S VIDEO FOR "MERRY CHRISTMAS (I DON'T WANT TO FIGHT TONIGHT)" CAPTURES EXUBERANT JOY OF THE HOLIDAYS! Christmas has come early with Little Steven and the Disciples of Soul's jubilant new video for their just-released holiday song "Merry Christmas (I Don't Want To Fight Tonight)." 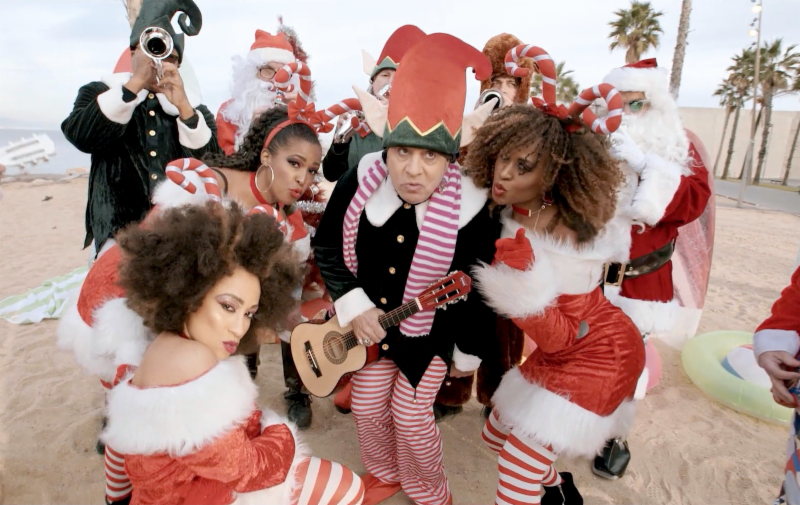 In the festive clip, frontman Steven Van Zandt, decked out in head-to-toe stripes, elf ears and a pointy hat, leads his 15-piece band, all dressed in their merry best, through a spirited update on The Ramones classic. The band, looking like they're having an absolute blast, performs the song with toy instruments on a sun-soaked beach and in their hometown New York City while footage from vintage movies and cartoons from the early 20th century like "A Trip To The Moon," "Santa Claus Conquers the Martians" and "A Christmas Carol" is interspersed throughout, adding to the videos exuberant nature. The video is premiering at Billboard over HERE.